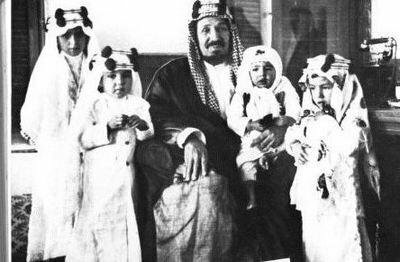 Abdulaziz Al Saud, founder of the Kingdom of Saudi Arabia, with some of his sons.Two weeks ago, Turki al-Faisal, chairman of Riyadh’s King Faisal Center for Research and Islamic Studies and ex-director of the Saudi intelligence agency, published an article on Asharq al-Awsat claiming that the members of the self-proclaimed “Islamic State” are “the new Kharijites of the Muslim world”. Accordingly, Da'esh—the Arabic acronym for the Islamic State of Iraq and the Levant (ISIL)—should be considered an updated version of the earliest sect in Islam, the group that in the seventh century “left the fold of Islam” becoming known for its barbarity and cruelty. Al-Faysal’s words echoed a claim that has been expressed by dozens of Saudi personalities in recent months, including the Grand Mufti Abdul Aziz Al ash-Sheikh, who made it clear that Daesh “is an extension of the Kharijites [...] we do not consider either of them Muslims”. It is hardly surprising that the tendency to associate Da'esh with the Kharijites (al-khawarij, “those who went out”) is increasingly mentioned on the media funded by the Saudi establishment (and not only on them). The relevance of this aspect goes far beyond an inter-religious and intra-religious dispute. It is an attempt to draw a sharp line between the strict Wahhabi doctrine—which shapes the religious and political life of the country—and the equally fundamentalist ideology shared by Da'esh’s members, to soften the tensions within and on the Kingdom. Stressing the differences between the two serves also the purpose of stemming the ambiguities that continue to characterize the feelings of a significant percentage of local public opinion in relation to the jihadist group led by Abu Bakr al-Baghdadi. Indeed, the attempt to unbind Da'esh from the Wahhabi’s legacy—in favor of this unlikely bond with Kharijism—appears problematic and largely connected to strategic and political objectives. The “Caliphate” continues to distribute copies of the texts written by Wahhabism’s founder Muhammad Ibn al-Wahhab in the areas of Iraq and Syria under its control, and draws on many of his most influential teachings, including the obligation for all Muslims to pledge allegiance to a single Muslim leader, preferably but not necessarily a caliph. Furthermore, extremist beliefs of the Khawarij can hardly be conflated with those of Da'esh. In spite of their radical approach and their extensive use of the practice of takfir (declaring other Muslims to be “infidels”), the Kharijites were not driven by an open hostility toward non-Muslims, or against local minorities. Courtesy of Middle East Eye. All rights reserved. To understand how Riyadh—that until recently has supported and funded groups then merged into the pseudo “Islamic State”—perceives and reacts to the current challenges, it is necessary to go beyond the arguments raised in recent months, focusing instead on the historical roots of the Saudi ambiguous attitude regarding the rising of Da'esh and on how this ambiguity has been functional to the exponential growth of the jihadist movement. The modern Saudi identity can be associated with two main components. The first one is linked to Ibn Abd al-Wahhab and the dynamics through which his radical “puritan” views—inspired by Ibn Taymiyyah’s teachings and his rejection of all forms of innovation or bid’a—were adopted by Muhammad ibn Saud in the mid-eighteenth century. The second relates to King Abd-al Aziz, which, in the twenties of the twentieth century, institutionalized the original Wahhabi vision through the establishment of the state. As argued by British diplomat Alastair Crooke, the rise of the “Islamic State” and its attempt to undermine the King’s legitimacy is perceived by a relevant percentage of Saudis, including some influential sheikhs, as a return to the true origins of the Saudi-Wahhab project. It is thus this “internal threat”, which bears the potential to undermine the very foundations of the monarchy, so much so as to have prompted the Saudi authorities to devote increasing energies to undermining Da'esh’s ideological basis. Over the last four years Riyadh has invested an enormous amount of resources in opposing the rise of any government or party that, in the Arab world, could have represented a credible alternative to the “Saudi model”. This also explains Riyadh’s decision to support the Egyptian army in the coup against former Islamist President Mohammed Morsi. In addition to that, recent policies adopted by Washington have been perceived with strong apprehension by the Saudi family. In particular, the overthrow of Saddam Hussein’s regime in 2003 and, more recently, the non-intervention in Syria, are still considered as indirect assistance to Iran. But the real threat to the Kingdom’s stability is hardly “external”: it comes from a movement (Da'esh) that in many respects represents a direct emanation of the Saudi historical legacy. As noted by King’s College antropologist Madawi al-Rasheed, “the kingdom and the caliphate are so similar that they are repulsed by each other. It seems that here similarity breeds contempt”. It is still too early to know whether the new Saudi King Salman bin Abdulaziz Al Saud will succeed to find the proper antidote to what seems to be the spark in a short circuit. What is evident is that the social and political landscape of the Middle East and North Africa has witnessed major shifts in recent years and that the policies recently adopted by the Saudi authorities, aiming at further curbing the already limited internal opposition movements, will create a growing instability in the country, opening new space for jihadist groups to emerge.